SARASOTA -- Homeowners’ associations and homeowners can come head to head over a number of issues and in south Sarasota County, deed restrictions may cost one family their pet. “He’s part of our family. It wouldn’t be complete without Hamilton. My girls love him,” says Cari McDowell about their miniature pot bellied pig named Hamilton. 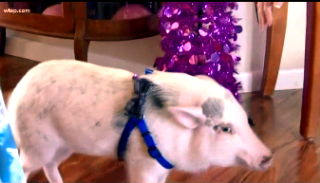 The year-and-a-half-old pig joined the family when he was 4 weeks old. Hamilton also likes to snuggle on the couch with Cari’s daughters. 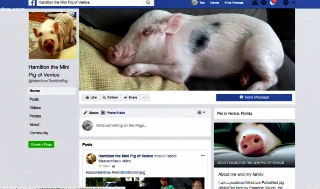 Before getting Hamilton, Cari says they checked with Sarasota County and learned pot bellied pigs are allowed as pets. They notified the HOA about the pig. Cari said the HOA’s attorneys would look into it. The family bought the pig thinking they were in the clear, but in October -- more than a year later -- the HOA’s attorney notified them. “They said we’re in violation,” said Cari. Sarasota County officials say homeowner association rules can be stricter than a county ordinance. County statute states HOA rules can trump county ordinance. County rule 1.7.2: These regulations are independent of private deed restrictions and other covenants and shall apply whether or not they are more restrictive than such restrictions. The county says it doesn’t get involved in county ordinance versus HOA debates. County officials say it’s a civil matter to be ironed out by the homeowner and HOA. The debate is over the definition of swine and if pets like Hamilton are considered a customary household pet. Deed restrictions prohibit swine as pets or anything that isn’t considered a common household pet but the rules don’t state which animals are acceptable. Cari said the HOA’s rules are 20 years old and need to be updated. “My family feels they are targeting us,” she added. Meanwhile support for Hamilton has grown. The 30-pound pig has his own Facebook page and a petition with more than 2,000 signatures for him to stay at the Woodmere Lakes home. The family hired an attorney to help keep him. Cari says her daughters would be heartbroken if they had to give up Hamilton. McDowell says the HOA’s attorney has given them until December 26 to respond. We reached out to the HOA but were told the attorney would not be available to make a comment until Tuesday.